Ran 1st playtest today. Shredder & 3x Hand Ninja vs a Lt. Stone and a bunch of cops. 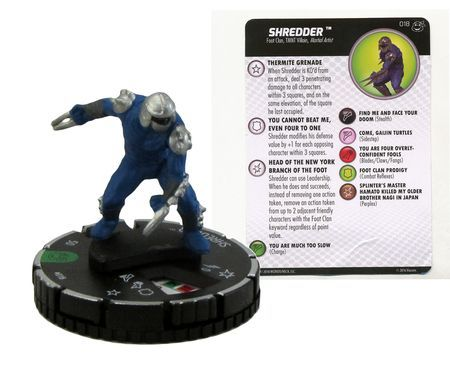 They never touched Shredder and Antagonizing Presence was really powerful although it did work against the ninja almost as much as it worked for them. I'm going to try Shredder & 2x Hand Ninja vs. Pluto and Shredder & 1x Hand Ninja vs some 330 & 340 cost heroes. No competitive concerns from me. Though thematically, should Splinter be immune to the attack boost part of the first power? It just seems odd to me that he 'wisely' decides not to benefit from something for... reasons? 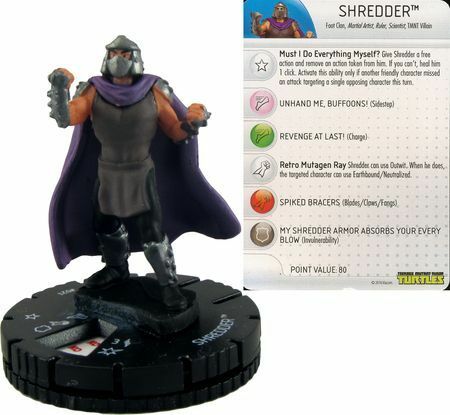 Like everyone else is like 'holly crap the Shredder!' and he's just like 'nah, ain't no thing but a chicken wing'. The immunity to the defense bit makes sense, but I'd think he'd still fight extra hard to stop his main bad guy. Though I'm not familiar with the IDW version of the turtles, so I guess their Splinter could just be a dispassionate sociopath or something. Any suggestions on how to word that? Also, after lots of testing, Shredder seems balanced at 250 points with Attack/Defense lowered to 4/4. However, I'm going to try some more tests with his Attack raised back to 5 and his Life lowered to 5. He'll be weak defending from range but will have a much better offensive output. 5 life, 5 attack, 4 defense at 250 looks good to me. Really cool and an awesome price point! Nice. Looking good to me, too. You've got this mini listed in the OP. Are you committed to him? I've got this one, and could get some pictures of it.